One, two, three, four- Toybank Toybank! Five, six, seven, eight- Toybank Toybank! What a Sunday! 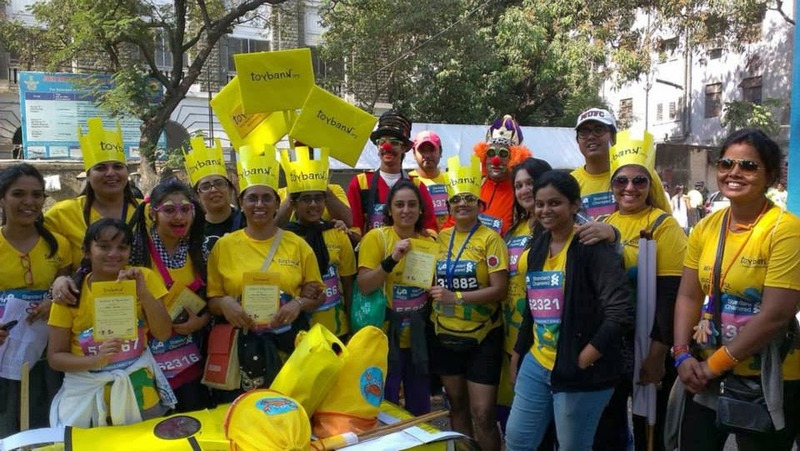 Moreover, what a Dream Run at the Mumbai Marathon this year! We have always been a bunch of enthusiastic people (tending towards being crazy at times as well), but this year we took it to another level… we showcased energy, joy, positivity, being united, and most importantly- love! Let me take the liberty and say- “our” usual Sundays entail getting up later than usual, have a lazy breakfast, catch some new flick at the cinema near us, have coffee with a few friends, think about the week to begin, introspect a bit (Don’t smirk. We do it from time to time!) and crash for the day. January 19, 2014 was to be different. 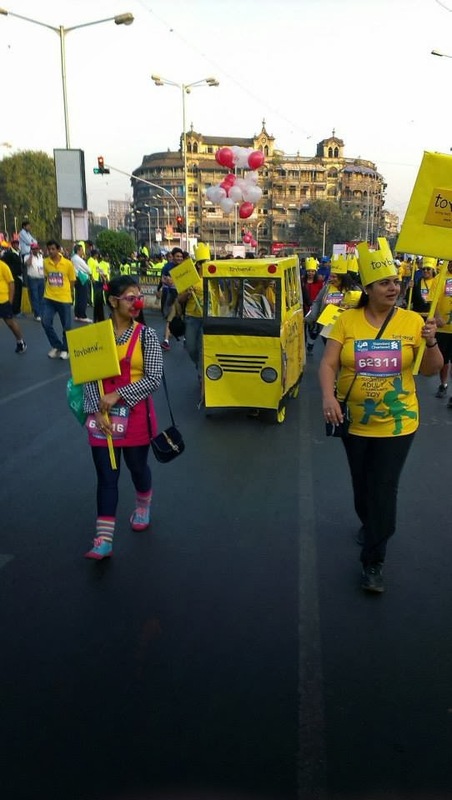 January 19, this year, was different for most of us at Toybank and in Mumbai who believe in something, who subconsciously, all the time, think about living it differently and who cheer the very idea of humanity. Now! Hold your breath- the Toybank Bus makes its grand entry. Boy! What magnificence! The yellow bus went, saw, and conquered! It got all the attention it deserved. Even before we set it up, people around us wanted to be clicked with it. The engineering and the concept behind it didn’t have to look for appreciation- praises and cheers came walking up to it. 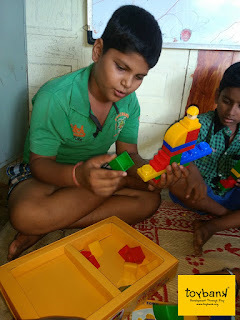 We at Toybank believe that children should get their rights to play and of course to education. Thus, the school bus signified childhood, play, and going to school. Our youngest Toybankers went behind the wheels to start the drive! 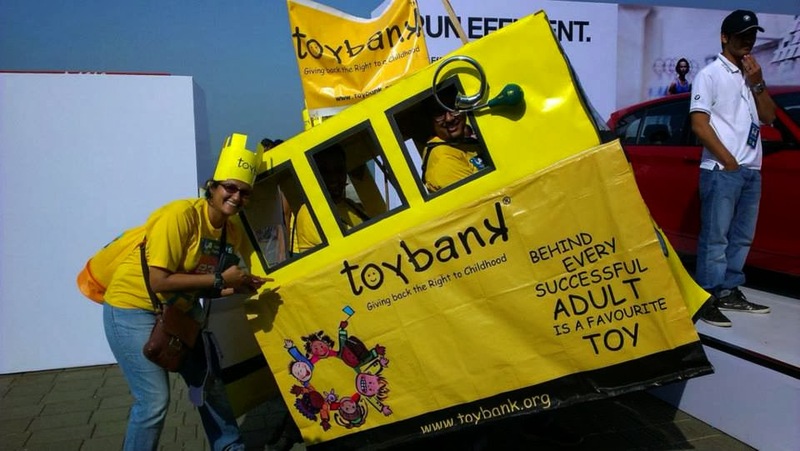 We walked up the stage at Azad Maidan to showcase Toybank and the other groups cheered us whole heartedly. Post the presentation, we buckled up for the real drive (read run, the Dream Run). Our bus met a few hurdles crossing the check points because of its size- but nothing could speed us down. Our engineers, masterminds, supporters, and our cheer leaders- wouldn’t let the Toybank Bus slow down for any reason. Toybankers and the pretty bus brought smiles to everybody’s faces. We danced, sang, cheered, jumped, and hugged through our entire 6 kms walk. Infants, babies in strollers, babies in arms, uncles, and supporters from other groups- everyone wanted to be photographed with us and the bus. Yes, I tried to rhyme the last sentence. 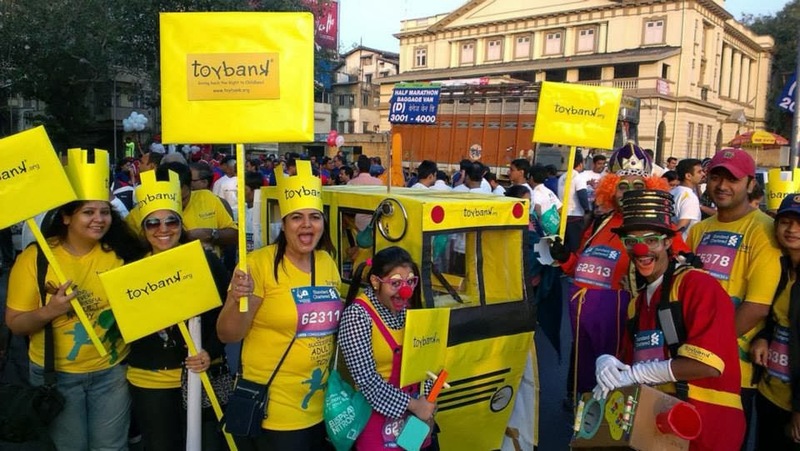 Toybank, in its tenth year, witnessed the best carnival, participation, and exposure at this year’s marathon. 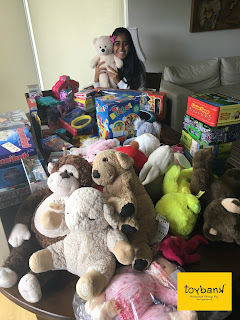 We could tell from their faces that Toybankers are feeling and thinking- “oh, it got over already!” As our strength of volunteers and people associated with Toybank increase every year, we envision bigger and better events going forward. This is indeed the beginning…we have many more miles to go, many more buses to drive, and many more roads to walk.